Over the past couple of months we’ve been sharing lots of news and photos from inside the refurbishment of Calderstones Mansion House, but it’s a rather impressive sight from the outside too! 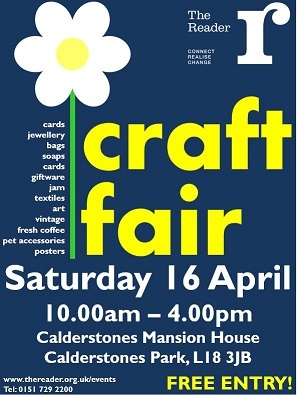 It’s only a couple more days until the Craft Fair takes over the Mansion House. This Saturday, 16th April from 10am – 4pm, we welcome a whole host of stalls, including the Knit and Natter Group who donate all of the proceeds from their stall straight back to The Reader. One of my best friends came up to visit me from London recently and I brought her along to the Knit and Natter group (of course!). I started a small craft group a few years ago with my three best friends and we would meet every week to craft and catch up, rotating meeting at each others houses. In all the time I have known her Suzanne hasn’t ever tried knitting. This was my chance to finally teach her and I seized it! By the end of the two hour session she had made a great start on her first scarf. She learned to cast on, knit, purl and repair mistakes as well. I sent her home with a set of needles and some wool and I’m happy to say she has kept up her knitting back in London. Sadly we have had to say a fond farewell to group member Rosie. She was a much loved member of the group but has moved back over to Texas, America. The group organised a farewell card which we all signed. They also had a rose that we could write on and sign as if we were all Lords and Ladies to impress her American friends! I think I signed it as Cat Lady Katie. We wish her the best of luck and really hope she keeps her promise to start a Knit and Natter group in Texas which we can all come and visit!